So much of what we consume – some say as much as 90% – comes through the Port, yet what happens behind the newly built corten wall on Todd Road is a bit of a mystery. Travelling west over the Westgate Bridge you may have seen a parade of neatly lined up cars on a concrete apron. That expanse of cars is the MIRRAT Auto Terminal. When the second stage of the project is complete by 2018, it will cover 355,000 square metres or the equivalent of 50 soccer pitches.1 MIRRAT is a subsidiary of Wallenius Wilhelmsen Terminal Holdings. 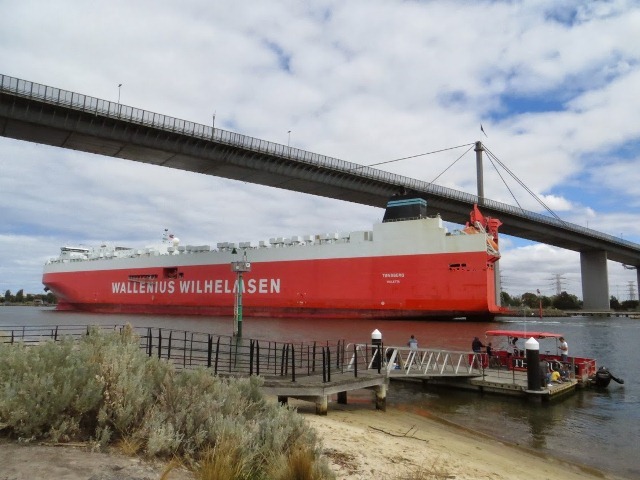 You will have seen Wallenius Wilhelmsen ships making their way up the River from Port Melbourne. Back in 2014 MIRRAT won the bid to construct a new auto terminal at Webb Dock as part of the Port Capacity Project. Instead of cars being ferried across the Bridge to paddocks alongside the Geelong Road, cars are now inspected on site before being delivered around the state by road transport. When all cars in Australia are imported when vehicle manufacturing ceases, the number of vehicles handled here will grow enormously – from 370,000 vehicles in 2013 to some 600,000 cars in 2025. By 2040 that figure is anticipated to be one million vehicles. The elegantly plain box like office building on piles, with architectural references to Le Corbusier, were designed by PLUS Architecture. You may be more familiar with their Port Melbourne projects: six level Armada in Nott St and 101 Bay Street. PLUS also designed the Gravity Tower which emerges from every viewpoint on the corner of Montague and Gladstone Streets. 260,000 tonnes of recycled concrete were used in the cluster of six buildings. Solar panels provide 80% of the administrative building’s power and large-scale water-recycling systems. There is also a roof garden with City and Westgate Bridge views and plants line an interior wall. PLUS wanted to create a good place to work since there are not many/any other amenities nearby. The facility uses directional LED lighting which has significantly reduces the amount of light spill that falls outside its boundary whilst also cutting energy consumption by around 30%. MIRRAT also uses bio-retention wetland ponds that trap storm water surrounding the terminal using a combination of plants, sand and soil to expel sediment and pollutants from the water before it’s released into the storm water network. Being so close to the Yarra River, this is of utmost importance. In recognition of these initiatives, MIRRAT has been accredited with an rating of Excellent from the Infrastructure and Sustainability Council of Australia (ISCA) and has been received the 2016 ISCA Leadership in Sustainable Infrastructure award. 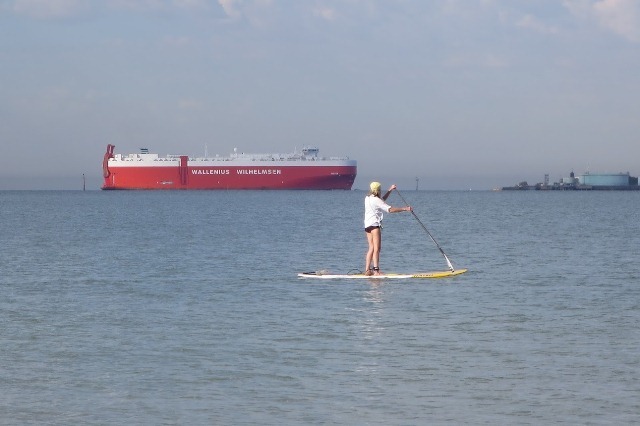 In 2005 Wallenius Wilhelmsen Logistics developed a Zero emission concept vessel called the Orcelle. This was supported by a zero emissions concept terminal in 2008 called Castor Green. A lot of the ideas and concepts that were developed through the Castor Green project have been implemented into the MIRRAT facility. Pressure is growing for the intentional maritime community to address this fundamentally important issue. The 14th annual green ship technology conference in Copenhagen currently underway (22 to 24 March) is a forum where that pressure is likely to grow.